When I was a kid, I looked forward to summer. Summer meant colorful flowers, warm weather and swimming. 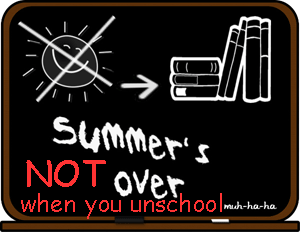 But most of all, summer meant no school. I was more relaxed. I felt less pressure. I felt free. When I first began homeschooling, I looked forward to summer. Summer meant colorful flowers, warm weather and swimming. But most of all, summer meant no school. I was more relaxed. I felt less pressure. I felt free. Then gradually, as our family moved towards unschooling, I realized I didn’t feel the same way about summer. I wasn’t more relaxed. I didn’t feel less pressure. I didn’t feel a change in my sense of freedom. Our homeschool had become relaxed the entire year. As I watched my kids, my attitude changed. I saw that during the summer months, my kids did not stop learning and exploring. As a matter of fact, they seemed to learn better when I relaxed and got out of the way. I stopped thinking about whether it was “school” time or summertime. I held on to the attitude of summer the whole year. I let my kids have more freedom to explore their interests, just like they did during the summer. We simply lived the pattern of our life, learning naturally. Some schools are making the change to school year-round. Our family decided to make the change to no-school year-round. You can too. It’s all about keeping that summer ‘tude. In October 1991, my husband and I took our two children, ages 6 and 8, out of government school and began our homeschooling adventure. After making this decision, I spent a lot of time searching for education experts who might be able to offer just the right input and advice. I wasted a lot of time before I finally found the experts I could trust – the experts who really had education and learning figured out. “Yes,” I answered quickly, trying to get back to my book. “From a walnut tree of course,” I replied, not lifting my eyes from the page.